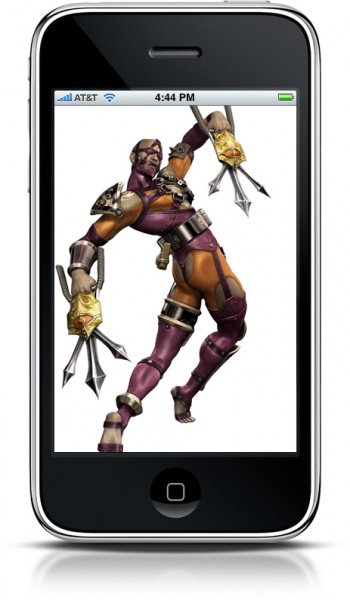 Namco knows you want to take Soul Calibur games with you everywhere, so it's bringing the original title to the iPhone. Earlier this week, Namco Bandai delighted a lot of people when it revealed that Ezio Auditore (of Assassin's Creed fame) was going to make a guest appearance in the upcoming Soul Calibur V. Not content to make only one big announcement before the weekend starts, the publisher's got some other news for fans of the franchise: Soul Calibur is coming to the iPhone. While [Namco Bandai VP of marketing Carlson Choi] wouldn't divulge any specific time frame for the game's availability, Choi said it would be available "soon." Namco Bandai has a serious presence in the App Store, but doesn't have too many ports of its better-known games available for the iPhone and iPad. That said, if the publisher is starting to jump on the porting bandwagon in earnest, it'll be interesting to see if any other Soul Calibur titles (or my personal favorite, Soul Blade) get brought to Apple devices.